Coronal lines in solar flares often demonstrate non-thermal broadening (NTB), i.e. broadening on top of expected broadening due to the thermal motion of ions. It has been shown that this broadening correlates with the plasma temperature: while spectral lines sensitive to ~1 MK demonstrate NTB corresponding to about 20-40 km/s, the lines sensitive to temperatures 15-20 MK show NTB corresponding to 100-150 km/s (see [1,2,5]). It is generally accepted that NTB represents spatially unresolved line-of-sight (LOS) motions (or LOS velocity dispersion), although there is no quantitative understanding of the physics of this effect in flares. In our study we exploit a numerical model of a solar flare  to investigate the velocity field in the flaring atmosphere. More specifically, we calculate the LOS velocities and LOS velocity dispersions for plasmas with different temperatures and compare them with observations (see  for more information). In the considered model, a kink-unstable twisted loop is formed due to slow rotation of foot-points of an initially potential coronal field over bipolar active region in gravitationally-stratified atmosphere [3,6]. When the twist angle is about 6π, the loop kinks, triggering anomalous resistivity, magnetic reconnection, and energy release. Unless otherwise stated, below we refer to the case with a loop length of 80 Mm, foot-point (FP) magnetic field 1500 G, and loop-top (LT) magnetic field of about 180 G. The loop radius increases from about 3 Mm at FP to about 9 Mm near LT. The density of the ambient atmosphere decreases from about 1014cm-3 near FPs (chromospheric level) to 109cm-3 at the height of the LT (about 40 Mm). Initially, the temperature of the chromosphere is about 8000 K, the temperature of the coronal plasma is about 0.9 MK. The fast energy release begins just after the kink and is about 110s long. A maximum plasma temperature of about 27 MK is achieved approximately 45s after the onset of fast energy release. We focus on the value of ρ2T-weighted LOS velocity dispersion, Δv (T), which represents the non-thermal broadening of a spectral line. It is calculated for several temperature intervals, making possible direct comparison of the computational model with observations. The velocity dispersion functions for the considered model are shown in Figure 1. The left panel shows the Δv(T) values for the FP parts of the loop (below 2.2 Mm), the right panel shows velocity dispersion for the coronal part of the loop (above 2.2 Mm) and the whole computational domain. Figure 1. LOS velocity dispersion Δv as a function of temperature. Plots in the left panel correspond to the foot-point part of the loop, plots in the right panel correspond to the loop-top part of the loop and the whole domain. The Δv(T) functions for the coronal part of the loop and the whole domain are not very different. The velocity dispersions for the whole domain are visibly lower in the temperature range <10 MK, due to the contribution of denser plasma of heated parts of the chromosphere and transition region. However, overall, they demonstrate the same trend, increasing from about 50-70 km/s at T= 1-2 MK, to 200-250 km/s at T ~25 MK. Velocity dispersion in the FP parts of the loop also shows positive correlation with temperature, increasing from 20-40 km/s at few MK to about 60-80 km/s at 20 MK. Remarkably, the velocity dispersions measured along magnetic field (i.e. for a loop observed from the top) are systematically higher than those measured in the perpendicular direction (i.e. when a loop observed from the side). This happens because the turbulence is suppressed across the magnetic field. Figure 2. Distribution of the current density, magnetic field and the root-mean-square deviation of velocity around an individual reconnection event occurring at the surface of the twisted loop close to the loop-top. 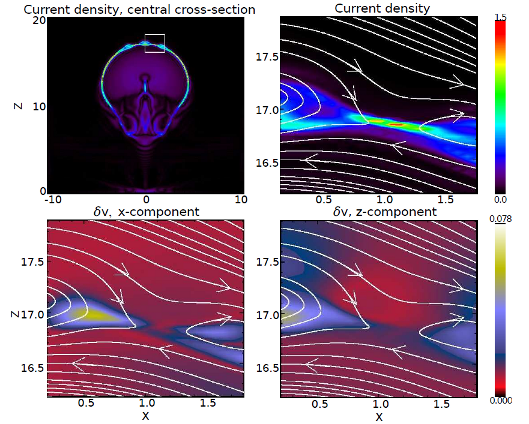 In the model considered, the plasma is heated by Ohmic dissipation in numerous small reconnection events occurring at layers of high current density formed after the kink instability. In order to understand the positive correlation between the velocity dispersion and temperature, we consider one of these reconnection events above the top of the reconnecting loop. Figure 2 shows the current density and magnetic field distribution, along with the ρ2T-weighted velocity deviations (which is practically the same, as the velocity dispersion). It can be seen, that this region contains a magnetic X-point with plasma inflow in vertical direction and plasma outflow in horizontal direction. The hot exhaust plasma accumulated in the outflow regions demonstrates high velocity dispersion. This is natural: because both the temperature and kinetic energy of plasma in the outflow region depend on the energy released in this elementary reconnection event, these quantities correlate with each other. Therefore, the correlation between the non-thermal broadening of coronal lines and plasma temperature indicates that a single mechanism is responsible both for plasma heating and turbulence in flaring atmospheres. Doschek, G.A., Mariska, J.T., Warren, H.P., Brown, C.M., Culhane, J.L., Hara, H., Watanabe, T., Young, P.R. & Mason, H.E., 2007, ApJL, 667, 109. Doschek, G.A., Warren, H.P., Mariska, J.T., Muglach, K., Culhane, J.L., Hara, H. & Watanabe, T., 2008, ApJ, 686, 1362. Gordovskyy, M., Browning, P.K., Kontar E.P. & Bian, N.H., 2014, A&A, 561, 72. Gordovskyy, M., Kontar E.P. & Browning, P.K., 2016, A&A, 589, 104. Harra, L.K., Matthews, S., Culhane, J.L. ; Cheung, M.C.M., Kontar, E.P. & Hara, H., 2013, ApJ, 774, 122. Pinto, R.F., Gordovskyy, M., Browning, P.K. & Vilmer, N., 2016, A&A, 585, 159.